We believe our employees are the foundation of our company. Have you heard about our benefits package? We have a 401k that is owner matched, offer paid vacation, quarterly performance/ safety bonus, paid life insurance, holiday pay and get you home every weekend. Freight is 99% no touch. Trucks have invertors and refrigerators. Join Our Team, Apply Online! 10 years ~ Great family atmosphere, new equipment, family owned and the home-time. I have 23 years experience, and like some of your drivers, I have driven for at least a half dozen companies. 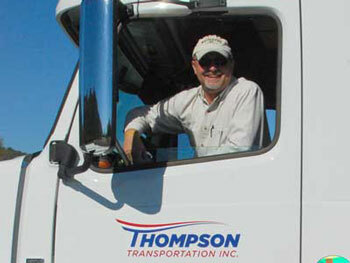 I have driven for Thompson Transportation for 5 years, and I cannot imagine driving for a different company. At Thompson, staff and drivers know each other by first name. We have an excellent staff and we truly are Family. We have top notch equipment that will keep you moving and making money. I truly plan on retiring at Thompson Transportation. Give Bo a call or come by and check us out.